Delivery: We personally deliver, within 200 miles $1 per mile one way ( $50 minimum) Further? Call for a quote. Individual comfort : made to fit YOU! 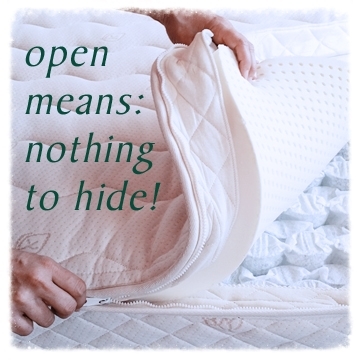 Our mattresses can open for YOU to inspect or modify & our EuroSlat Foundation lets YOU control YOUR Support. Discover natural, chemically-safe, perfect fit, sleep. EuroSlat Foundation. The SMART box spring replacement! Premier Choices: Design Sleep Trusted Classics. Search no further.... Everybody loves them. The classics offer extreme ergonomic function and fit with familiar feel. 10 year warranty. Comfort exchange available. System Price includes EuroSlat foundation. Eco-Choices: Design Sleep Healthy Value. Designed for those who want the best quality at an affordable price. 10 year warranty. The Euro Simple has an optional comfort exchange. System price includes EuroSlat foundation. Children’s Choice: Design Sleep Healthy Beginnings. Chemically Safe Beds for EVERYONE, without paying brand name prices. In 5 Minutes: What you need to know before you buy a mattress anywhere.